Inside the T-Mobile Galaxy S II retail box, you will find a nice looking wall charger, a USB cable, an MHL adapter, as well as a pair of high quality headphones from Samsung. The usual T-Mobile booklets, along with the handset, complete the package. A microSD card is notably missing from the droid’s retail box. We attribute this to the 16 gigs worth of built-in storage which the Galaxy S II has. With a bigger screen on board, it was only logical that the T-Mobile Galaxy S II has grown in measures as well. It is definitely a device with a lot of presence. Thankfully, the gain is not that drastic, compared to the rest of the Galaxy S II lineup. With 131 x 70 x 9 mm, and 135 grams of weight, the droid still qualifies as being quite pocket friendly. In terms of size and measurements, the T-Mobile Galaxy S II sits right in the middle of the U.S. lineup. It is a tad smaller than the Sprint Wireless version, despite having the same screen size, and quite bigger than the AT&T Galaxy S II. The back of the smartphone is made from pleasant, soft feel with a very fine texture – a sharp departure from the plastic used in the rest of the Galaxy S II lineup. There is a nice metal bezel encircling the device, while the front is all about Corning Gorilla Glass in terms of material used. We can describe you the 4.52” Super AMOLED Plus screen of the droid with only one word – gorgeous. We are yet to see a better screen on a mobile device. Despite the fact that there are screens with higher resolution out there, yet none of the them comes even close to the Super AMOLED Plus of the Galaxy S II. It simply wows you every time you turn it on. You can find out more about the technology behind the Super AMOLED Plus screens here. Below the large screen, you will find four touch-sensitive buttons – just like in the rest of the U.S. lineup of Galaxy S II devices. The earpiece, ambient light and proximity sensors, as well as the 2MP front-facing camera unit are located in the area above the screen. The left side of the Samsung Galaxy S II for T-Mobile features the volume rocker. The volume keys double as zoom lever in camera mode. Once again, there is no dedicated camera button on the right side of the smartphone. We believe that a camera unit this capable surely deserves one, as the virtual shutter key is far from perfect. As usual, there is a 3.5mm audio jack on the top of the device. In addition to it, you will find a second microphone which is used for active noise cancelling. The microUSB port at the bottom is used for both data connections and charging. Not only does it support USB host but it also comes with MHL enabling HDTV-out connectivity with the proper adapter. The mouthpiece completes the picture. MHL is a way of using both microUSB and HDMI through the same port. It makes sense, especially provided an HDMI port could’ve been near impossible to put in a phone this slim. The downside is you need an adapter to use a regular HDMI cable with this one. The back of the Galaxy S II is where the 8 megapixel Full HD-capable camera lens is located. Right under it is the LED flash, which will probably see more use a flashlight and video-light than a still-camera assist. The loudspeaker grille is also on the back of the device. It is located on the slightly elevated chin at the bottom. The chin is not as pronounced as in the rest of the Galaxy S II GSM lineup. Removing the paper thin battery cover reveals the SIM compartment, the 1850 mAh battery and the microSD card slot. The card slot can take microSD cards of up to 32GB, which can give you a maximum total storage of 48GB. 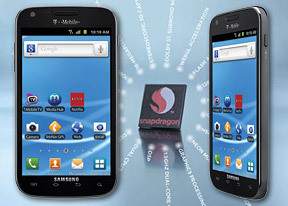 Interestingly enough, both the SIM and microSD cards are hot-swappable. The 1850 mAh battery made it easily through a day of heavy usage which included about an hour of web browsing, an hour of phone calls, as well as a serious amount of video game play. Lasting for two full days is a bit of a stretch if you are a smartphone junkie like us. Handling the T-Mobile Galaxy S II feels nice. The textured plastic on the back prevents accidental drops, while the premium materials used in the rest of the device make it known to everyone that you are holding a serious piece of smartphone goodness.